Good day my beautiful readers!! What a nice day to wake up with all the blessings Our All Mighty has in store for us right? Let's attract all those positive energy,shall we?!! I received my very first blogger kit from HBC!! YAY.. I am so excited because I have been lurking in their shops since I don't know when. It is such a privilege to be part of their exclusive blogger list. However, that does not mean that I will compromise the integrity of my posts for these companies (i just have to be emphatic about this). Anyways, i have thrown away a lot of NYX blushes. They have been with me for like 3 years!!Waahh.. I did not even hit pan on most of them except Taupe. That is why I am so thankful that I received these goodies. I was about to buy ELF studioline blushes but I do not like the color variety that much. The plastic packaging is really tacky and flimsy. However, I love that you can easily see the shade of the blush because of the clear plastic covering. I so love the fact that it has a manufacturing date and an expiry date. I would always look for this when I am buying cosmetics and skin care products. The shades in my opinion are very nice. They are all very wearable. This is a brownish/coppery orange blush. I am not really into this kind of colors because I thought it would look muddy on me but it works well on my skin. I will definitely use it as a bronzer paired with a pink lipstick. This is my least favorite among the shades. The shimmers are not very noticeable but it give my skin a soft sheen. This is a beautiful coral shade. I love the color. It reminds me of the blush in teh ELF studioline Blush and Bronzer compact. This has tiny gold shimmer which is hardly seen when you wear the blush. I am not into shimmers but how I wish the gold specks are more conspicuous to add more glow to this blush. This is my most favorite among the four. This is a matte true peach blush. NO hints of pink at all. I remembered buying Careline Blush in Peach and it hardly shows on my skin. This blush is so beautiful on my NC35 skin (medium yellow toned skin). I actually felt pretty wearing this yesterday. Some peach/orange looks fake on my yellow skin but this gives me a beautiful flush. I am so in love with blush because it's matte and very buildable. This reminds me a lot of NYX Angel Blush but this is more pigmented and with less shimmer. This is a neutral baby pink. I was afraid that it won't show up on my skin but fortunately, it did! haha.. The peach blush is so beautiful noh? The shade stands out among the 4 blushes. These blushes are a bit powdery except for the Mocha Blush which I think is very soft. However, they blend beautifully on my skin. I hate blushes that just sit on my cheeks making me look like a clown. I would give San San Blushes an -A for this. Do not attempt to use this brush. This sheds like crazy and it really pierces my cheek when I used it. I hope they just do away with the brush and add more product instead or a mirror in replacement. The shades are really nice and perfect for everyday wear. They pigmentation is good NOT great. It may appear sheer upon your first application but the shade is very buildable. Very affordable for 100 pesos! The packaging is very flimsy. The brush is not useful at all. 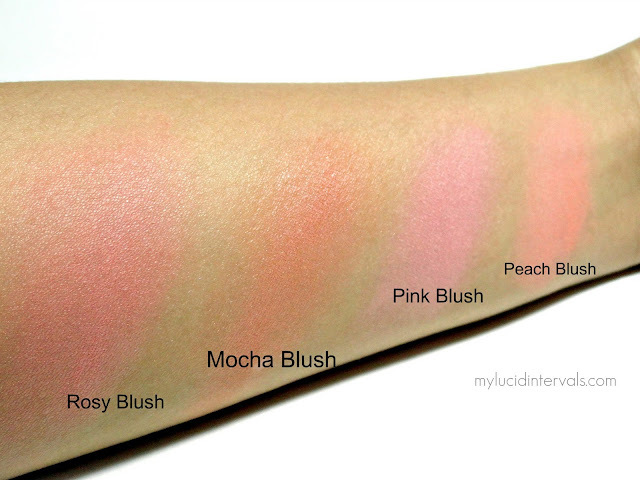 The blushes are powdery except for the mocha blush. They also sent me this brochure showing their best buys of the year! I can't stop ogling on them. I want to back and get goodies especially their body scrub and whitening solutions and soap!! I want these too... waahhh i never knew they sell hair mousse. How come I do not see these in their store everytime I visit? Do you own these blushes? Watch out for my reader of the month segment after Christmas!! Have a blessed and happy Christmas everyone!! OOOO Those are pretty! I like the peach one the best! I hate how some cosmetics come with brushes.. they are never good quality! I own honey blush and I like it too! It's orange-y but it looks natural on me when blended. Mine came with a different brush though - it has black hairs. I bought it months ago so maybe they changed it. I wonder why they replaced it since the one I have does its job. Not perfect but it would do when I don't have my go-to blush brush around. o yeah, now I remember that I found the brush I have too stiff when I got it but when I was forced to use it, it turned out to be not that bad since the color that I chose needs a light handed application. Hope they come up with a softer brush. the pink blush looks fab. Wow! Your photos are so clear and defined. What camera do you use in taking photos? Anyway.. I think I like the Mocha blush. Hello! I have pink blush and I like it so far. It's pigmented but not overly dramatic. I also have their Age Defense blush in Frosty Pink (which I prefer over this one), it appears to be more subtle with just a hint of shimmer. I agree that the brush is useless. I am so going to buy the peach blush today. haha..Donna talaga! aarrmmpphhh! Was thinking of buying this Sis Donna, but I want to ask if the pink blush is like baby pink? Or is it a simple dusty pink ganun? Naghahanap kasi ako ng cheap baby pink colored powder blush eh. wow, sana pala bumili ako nung sale nila! sayang! may i ask lang din po pala, how do you become an hbc blogger?